Police investigating the killing of a man in Belfast this morning say two gunmen carried out the attack, which is thought to be linked to a feud among loyalist paramilitaries in which three other people have already been killed. The latest victim, named locally as Mick Green, was approached from behind as he parked his motorbike and shot several times at point blank range, killing him instantly. It happened as Mr Green arrived at work to open up a furniture shop in Sandy Row, at 8.15am. He opened the store every morning and his movements would have been known to his killers. Mr Green, a 42-year-old father-of-three, was from the Ballysillan area of north Belfast, a known Loyalist Volunteer Force stronghold. The LVF has blamed the rival Ulster Volunteer Force for the killing. 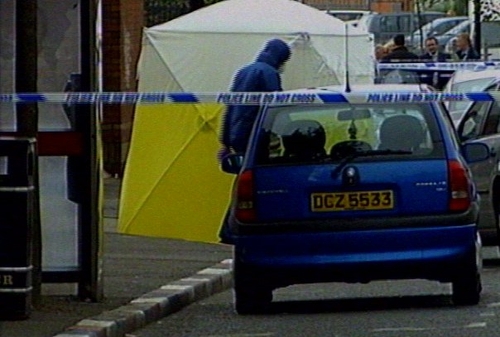 Police have not directly connected the killing to the ongoing loyalist feud between the UVF and the LVF. However, they say it is a positive line of inquiry and they are appealing to community leaders to prevent further bloodshed. The scene was sealed off by police after the shooting. A post mortem examination was to be carried out and police appealed for witnesses to the shooting to come forward. Ulster Unionist MLA Michael McGimpsey, whose constituency office is yards from the scene of the shooting, condemned the murder as barbaric and abhorrent. To date four people have died in the latest round of the loyalist feud. All four murders have been blamed on the UVF, effectively representing a purge against any individuals connected to the smaller LVF grouping.